As Jefferson nickels gain in popularity values begin to widen between low condition coins and high quality examples. 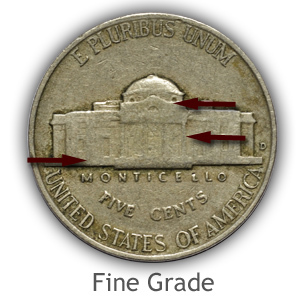 Accurately grading Jefferson nickels becomes necessary. Reviewing the video and images below; differences in condition become easier to judge. Your coins may be worn, however to what degree? Subtle details remaining now determine how much its worth. In today's market the focus is primarily in the Mint State grade; coins as minted without any wear to the surface. 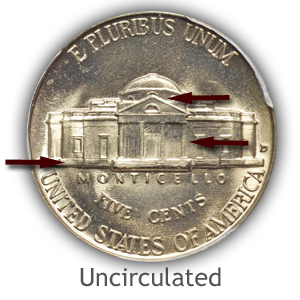 When choosing a coin to add to their collection the uncirculated (mint state) grade is a collector's first choice. 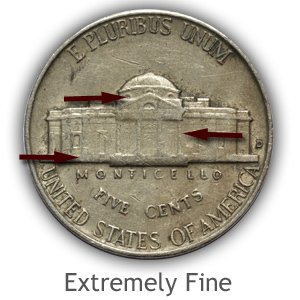 Detailed below is the process to judge, identify and separate out these collector quality old nickels. 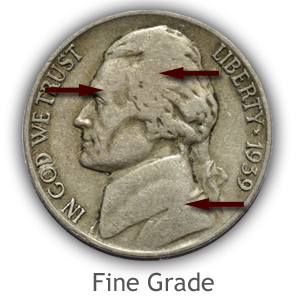 Continue the process of placing an accurate grade and ultimately an accurate value on your Jefferson nickels. Pictured is an example of a collector grade nickel. Uncirculated condition is confirmed by delicate luster covering the surface completely. No breaks in the luster due to wear are evident. If this coin was ever in circulation the high points would lack the shimmer of the fine grain to the surface. All areas of Jefferson's hair must show mint frost. Above his eye is a prominent area prone to first signs of wear. Along the shoulder and collar luster flows with no dulling from wear. Lines of the triangle are high areas and subject to show any luster disturbance. Columns are also main areas to inspect for any disturbance of mint luster. 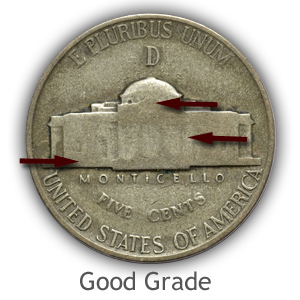 Confirm the mint state grade by lack of any wear to the foundation of Monticello. A small amount of wear covers the surface. However the finer details are only slightly worn and remain. All of the fine detail of Jefferson's hair now show light wear and lack of luster. Cheek is worn somewhat but separate from area above eye. Line of collar at the shoulder is distinct and separate. Well defined is the overall impression, columns are still bold. Fine raised lines of triangle although worn are visible. Foundation line on right side is merging slightly with building, vertical lines of building are visible. In fine condition wear has removed most of the higher relief detail. Even if just outlines, all major elements of the design remain. Smooth areas are evident in the top, middle and lower parts of hair. Above the eye is now flattened and trying to merge with cheek. Line of collar is just beginning to fade at highest part over shoulder. All columns remain visible however somewhat faint. Raised triangle detail above columns is now lost and merged with gable. Foundation line and vertical lines of Monticello are now beginning to merge, noticeably on right side. Overall heavy wear is the impression of a Jefferson nickel in Good condition. Gone are all but outlines of the major designs. Current demand for Jefferson nickels in Good condition is low. Affordability of higher grades limits the values of these coins. 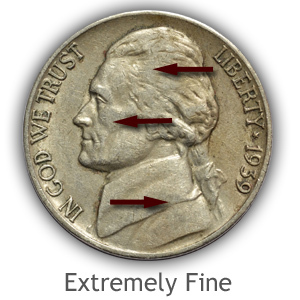 Wide areas of wear and flatness in Jefferson's hair, only the deepest recesses of the design remain. Areas above the eye, cheek and jaw are connected. Lost is both the collar line at shoulder and separation of hair from forehead. Monticello is mostly without detail. Columns are missing, gable has merged. Foundation line is now flat with only faint detail of building remaining. 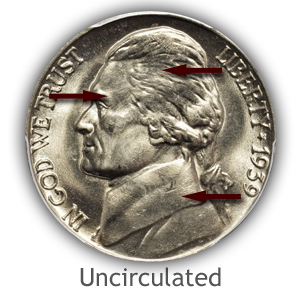 Circulated Jefferson nickels are still in the early stages of collectability. Dates from the thirties and forties show the greatest potential for demand in slightly worn condition. Focus your attention on the Mint State (uncirculated) grade to find today's and future value leaders. Nickels from the old Liberty nickel to the popular and collectable Buffalo nickel. Video, images and descriptions define what is needed to grade these coins. 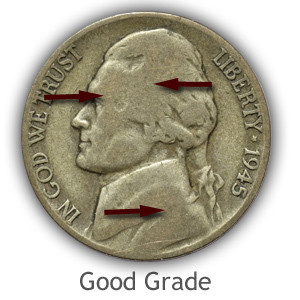 Put to use the grading skills to evaluate Jefferson nickel condition. Values by date and grade listed. Value charts in combination with grading images to judge condition. 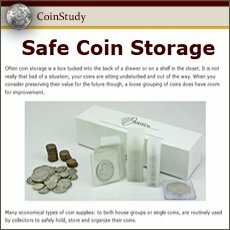 Discover how much your old coin are worth. Coin series spanning Cents to Gold. Get the best price if selling by knowing the accurate value of your coins.